Last Day on Mars is about a boy named Liam and his final hours on Mars. Since the Earth was burned by the Sun, everybody fled to Mars. While the Sun is getting closer to Mars, Liam’s parents are planning for everone to move to a star far away. Later, when the starliners are starting to leave the star, Liam and his friend Phoebe discover many new things about Mars. The last starliner is leaving and Liam and Phoebe aren’t on it. Will they get to the star somehow or be burned by the sun on Mars? I thought that this book was great! There was a lot of mystery in each chapter. This book not only had a lot of action but it showed friendship as well. 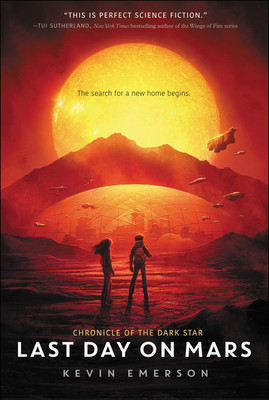 Last Day on Mars is a very suspenseful book, which made me want to read it all the time! I’m excited for the next book in the series to come out! It is Earth year 2213--but, of course, there is no Earth anymore. Not since it was burned to a cinder by the sun, which has mysteriously begun the process of going supernova. The human race has fled to Mars, but this was only a temporary solution while we have prepared for a second trip: a one-hundred-fifty-year journey to a distant star, our best guess at where we might find a new home. Liam Saunders-Chang is one of the last humans left on Mars. The son of two scientists who have been racing against time to create technology vital to humanity's survival, Liam, along with his friend Phoebe, will be on the last starliner to depart before Mars, like Earth before it, is destroyed.